While covering the most recent Japan Super Show in Tokyo, LRM staff photographer Edgar Hoill came across some cool-looking trunk setups. All he could talk about on his return was the cars and how clean they looked. Even though he couldn’t translate or read the show signs, he could appreciate the work that went into the vehicles so he shot some pictures to share with us a few of the custom cars that he saw during his trip to Japan. This ’64 Impala is no stranger to the lowrider circuit. Once a “flagship” vehicle for SouthSide Car Club, the ’64 looks much the same as it did in its L.A. heyday with only minor changes. Edgar had never seen the car when it was in the States, so he was able to appreciate it as one does a first-time find. He snapped some shots and, to our surprise, the trunk had been redone. 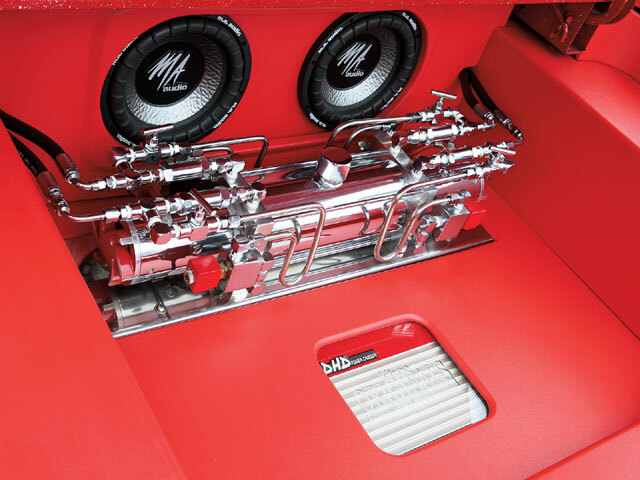 The new trunk features a pair of Pesco pumps built by Andy of Adex, along with a sound system that was incorporated. 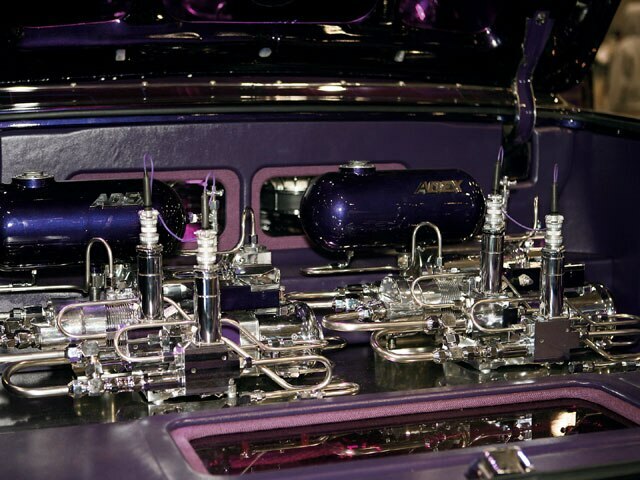 The trunk was downsized as the owner probably felt that you no longer need four pumps to score enough points to win Best Hydraulics at a show. The pumps had four Adex chrome square dumps with stainless steel tubing. Trunk panels hide the batteries and highlight the sound system that can be seen through Plexiglas inserts. This new trunk really complements the iconic lowrider that found its way overseas and is still putting in work on the show circuit. BumpsEdgar also came across this ‘62 Impala convertible that features a trunk done up by Kura Kawa Hydraulics, who installed a custom hydraulics setup and audio system. The setup consists of a single whammy pump featuring dual pressure and dual side returns. The audio portion was hooked up with a custom box that houses a pair of MA Audio 12-inch woofers. The entire trunk was wrapped and covered in vinyl to match the car. It’s so simple and allows the trunk compartment to look super-clean. Edgar told us that the reason why this car caught his attention was because it was playing some kind of Japanese rap and it sounded “really good.” Thanks for keeping your ears open, Edgar. DumpsVehicle’64 Chevy Impala, “SouthSide Player”City/StateTokyo, JapanClubIntimate C.C.